Patients treated with cannabis demonstrated a reduced response rate to immunotherapy, investigators found. Administering cannabis to patients with cancer undergoing immunotherapy may lower the response rate to therapy without having an effect on progression-free survival (PFS) or overall survival (OS), according to study findings presented at the European Society of Medical Oncology (ESMO) 2017 Congress. 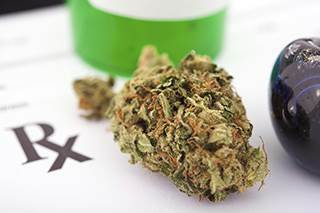 Patients with cancer commonly receive immunotherapy to improve the body’s response to tumors but also receive cannabis for palliative purposes, which has been associated with immunosuppressive effects. For this retrospective, observational study, researchers assessed the data collected from 140 patients with advanced melanoma, non-small cell lung cancer (NSCLC), and renal cell carcinoma (RCC) who were treated with nivolumab. Eighty-nine patients received nivolumab alone, and 51 patients received cannabis in combination with nivolumab. A multivariant model showed that the only significant factor that lowered the response rate to immunotherapy was cannabis; patients who received nivolumab alone achieved a response rate of 37.5% compared to 15.9% in patients who received the combination (odds ratio [OR], 3.13; 95% CI, 1.24-8.13; P =.016). PFS and OS were not affected by cannabis. Factors that affected PFS were metastases, smoking, and response to therapy. Factors that affected OS were smoking, hypertension, disease progression, low performance score, and brain metastases. 1. Taha T, Talhamy S, Wollner M, et al. The effect of cannabis use on tumor response to nivolumab in patients with advanced malignancies. Oral presentation at: ESMO 2017 Congress; September 8-12, 2017; Madrid, Spain. Abstract 1545PD.